These are links to all the articles that Peter has written for MUFOB and Magonia that are on-line, and to the INTCAT catalogue he compiled. INTCAT is still being revised and updated from Peter's files. I have known Peter for nearly fifty years. At first it was just through the letters he sent to the little magazine, the Merseyside UFO Bulletin, that I published with my colleague John Harney. Even from the first letter we received from him it was clear that here was someone with a wonderful grasp of the complexity of the rather odd subjects we were writing about, who had great imagination and displayed a remarkable width and depth of reading. And someone, we learned to our amazement, who was just eighteen years old! I met Peter in person a year or so after reading his first letter to the Bulletin, when he finagled an invitation for me to speak at a meeting of his local UFO study group – DIGAP – at the Friends Meeting House in Manchester. I was interested to find that he was a student at Manchester Poly, studying librarianship, my own profession. I also strongly suspected that he had arranged my invitation in the clear knowledge that almost everything I was going to say would be sure to annoy most of the other members of the group. From that moment I knew he was someone I was going to get along with very well indeed. In all the decades of our friendship, I doubt that the number of days we have actually spent in each other's company would total much more than a month – occasional trips between Liverpool and Manchester, even fewer trips between Manchester and points South, but friendships can be just as strong conducted by letter and phone-call. In this time he wrote a great number of fascinating and thought-provoking articles for the magazine I edited – by now called 'Magonia' – which helped to completely change the way in which researchers studied many controversial phenomena and often caused considerable controversy in the field. His phone-calls were legendarily long, and our conversation roamed from UFOs, ghosts, strange beliefs and the whole range of what might be called the paranormal, to politics, history, even alternative history – we speculated on the survival of the ancient state of Brigantia into modern times for instance – and to anything else from Sherlock Holmes and Coronation Street to Northern Rail and the Metrolink – he had very strong opinions on those two! Not getting a call from Peter at 5.30 on a Sunday afternoon will take a lot of getting used to. His fields of interest – radical and working class history, local studies and folklore, alongside UFOs, the paranormal and all manner of curious visions and beliefs - may seem odd bedfellows, but his experience as a local historian and his study of the lore and legends of the North of England – Brigantia - linked directly to his study of the social and historical origins of many mysterious visions and strange beliefs. I remember him telling me that at the local history library, many of the enquiries he dealt with from people searching for the history of their homes were actually from people wanting to find out who had died in the house and was now haunting it. It was the same with his interest in the social history of ordinary people's lives, which revealed how they expressed their beliefs in ways which now seem impossible to understand: the strange lights seen at the time of the Welsh religious revival; the visions in the sky from the years of the English Civil War; the invasion scares at the turn of the last century that produced stories of phantom airships; the rapid urbanisation and industrialisation of Victorian society that allowed the legend of Spring Heeled Jack to come to life. Peter's work analysing the phenomena that he studied was appreciated across the world by other researchers, and many people who have never met or spoken to him have expressed to me their sense of loss over his death. Another wrote: “Sad news indeed. His writing and his insight will be much missed. But we do have an extraordinary body of work by which to remember him”. For a few years Peter had been making arrangements for his huge collection of books to be preserved as a source for future researchers, and they have gradually been transferred to the AFU Library, a specialist collection in Sweden. Just a few days ago I helped Clas Svahn from AFU load up the last of his UFO, paranormal and Fortean material to be shipped to Sweden, where they will be preserved at their archive and made available to researchers and students from around the world. Clas described Peter as “a light filled with knowledge” and through his library that light will continue to shine. I will also do all I can to ensure that his written legacy will be preserved on-line for all to read. Peter had strong views on politics and society, and was passionate about right and wrong, but without the sterile dogmatism which he loathed. Although in many ways he and I were poles apart politically, in our endless Sunday afternoon debates we seemed to agree far more than we disagreed. And this was because, although he had firm beliefs, he was sceptical of any ideology, religious or secular, which sought to impose rigid limits on humanity. “The anthropologist Mary Douglas once wrote a book called 'Purity and Danger' but a book called ‘Purity is Danger’ would be more apposite, for surely all the worst crimes are committed in the name of purity and pure lands: pure religion, pure nation, pure race, pure people, pure lands that no actual human being is ever pure enough to inhabit. Even within our own liberal West there are those who want ever more pure bodies and pure minds. This is the obituary I wrote for Peter, which appeared in the 'Necrolog' column in Fortean Times 366, May 2018. In 1961 a ten-year-old Peter Rogerson was having his hair cut at the local barber's in Urmston, his home town just outside Manchester. In the corner of the shop there was one of those old-style wire paperback spinners. One book in particular caught his eye. It was Aime Michel's The Truth About Flying Saucers. The words 'FLYING SAUCERS' stood out in big, bold capital letters. After his haircut he rushed home, got a half-crown (12½p.) and hurried back to the shop to buy what he described as “… not just my actual first UFO book, but my actual first real grown-up book.” He added: “If any book set my life on its course, this is it.﻿"
Caught up in the excitement of the UFO flaps in the 1960s he devoured everything that he could on the topic, joining the Manchester-based UFO group DIGAP. Listening to some of the naive views expounded by members of this group, and through his deeper reading around the subject, he began to realise that the so-called 'extraterrestrial hypothesis' (ETH) was incapable of answering the ever more complex questions that the topic raised. It was becoming clear to him that the UFO experience was intimately linked to a whole range of other anomalous experiences, and the insistence of believing in a 'nuts and bolts' explanation for the phenomenon simply blocked any attempt to gain a broader understanding. At this time writers such as John Keel and Jacques Vallée were also starting to think in this direction. In the late 1960s my colleague John Harney and I were publishing the Merseyside UFO Bulletin, a typical 'zine of the time, turned out on a hand-cranked stencil duplicator. We had become rather unpopular with some of the old-school ufologists because of our critical attitudes, but when Peter found a copy of the Bulletin in a box of magazines at a DIGAP meeting it chimed with the ideas he was developing himself. He wrote a 'Letter to the Editor' which exploded with ideas, placing UFOs firmly into the Fortean field, and signalling the start of what became known as the 'New Ufology'. From then on he was a regular contributor to the Bulletin and its successor incarnations through more than four decades, providing a series of thoughtful and thought-provoking articles and incisive book reviews, as well as compiling the massive INTCAT listing of entity reports. Peter spent his working life as a librarian, with a special interest in local history. He was the local history librarian for Warrington libraries until his retirement, and this contact with the past enabled him to see that the events described by UFO experiencers were paralleled by the stories told for centuries about contacts with unknown and other-worldly entities. This extended to ghosts and hauntings; he commented once that in his work at the library a large proportion of people who enquired about the history of their houses were in fact searching to see who had died in the house and was subsequently haunting it! Along with his Magonia colleagues, particularly Roger Sandell, and through correspondence with French ufologists like Michel Monnerie and Thierry Pinvidic, he was instrumental in developing the idea of 'psychosocial ufology'. The Psychosocial Hypothesis (PSH) secularised some of the occult-influenced ideas that had begun to circulate amongst ufologists unsatisfied with the ETH. It suggested that known psychological processes such as hypnopompic and hypnogogic imagery, distortions of perception and the unreliability of memory in many circumstances, could be influenced by factors such as popular culture, mass-media, social conditioning, folklore, historical precedents, myth and legend, to explain many of the stranger aspects of the UFO mystery, without recourse to occult or psychic phenomenon. Besides his work in helping transform British ufology, his other interests included the study of folklore, particularly Lancashire tales and legends; working-class and radical history and politics, and electoral systems around the world. As the chief book reviewer for Magonia he built up a massive collection of books on ufology, psychic research, paranormal phenomena and other Fortean topics. Perhaps, after Hilary Evans's, the largest such collection in the UK. On top of this were his collections of political and historical titles. His home in Urmston, where he lived his entire life, resembled the classical Fortean image of a book-filled house with barely room between the stacks to move about! Fortunately Peter had made preparations for the distribution of this unique collection, and a great deal of it has already been transferred under the supervision of Clas Svahn to the Archive for the Unexplained (AFU) in Norrköping, Sweden, so it will always be available for scholars and students. It is a shame that no suitable resting-place could be found in Britain. His main legacy however will be his writings; erudite, scholarly, often controversial, sometimes even angry, but always leading to a deeper and broader understanding of the topics he studied. 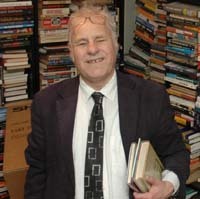 Peter Rogerson. Librarian, archivist, ufologist, book collector. Born Urmston, Lancashire, 1 July 1951; died Manchester, 6 March 2018, aged 67.